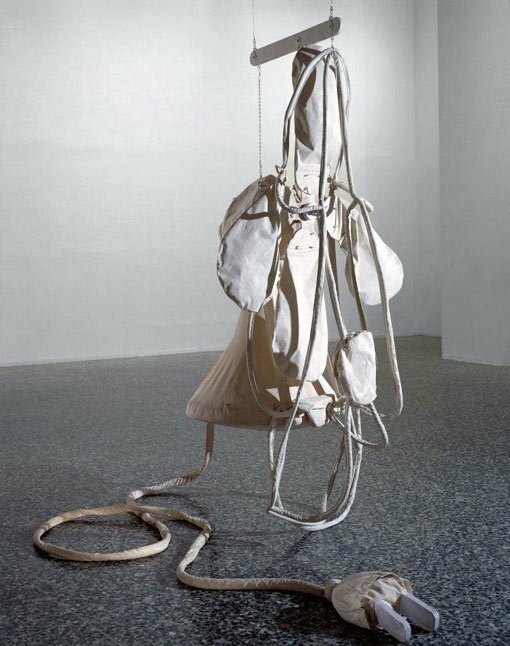 Claes Oldenburg pioneered a unique pop aesthetic based on handmade objects. His Giant soft fan hangs limp from the ceiling, dragged down by gravity. Its exaggerated size and sagging form makes a familiar object both strange and humanlike. The subtitle of this work, ‘ghost version’, refers to its colour. Oldenburg also made a companion Giant soft fan in black vinyl (Museum of Modern Art, New York). He described the pair as ‘winged victories’ – suggesting they were modern equivalents of a famous ancient Greek heroic statue. But Oldenburg’s wilted fans subvert all expectations of monumental sculpture. Hard becomes soft, the heroic is replaced with the banal, the grounded becomes airborne and structure is left to chance. What is your initial reaction to Giant soft fan – ghost version by Oldenburg? Does your opinion change knowing it is part of a pair? Do you agree with the artist comparing the works to Greek heroic statues? Discuss. Create a visual timeline of soft sculptures by Oldenburg, examining how the works have changed over time. As a class, create soft sculptures of objects in popular culture. Display these works around the school in unconventional ways. What are the reactions of other students and teachers? Interview some of them to find out more about their responses. Find examples of artworks that reflect the shift from optimism to disaffection and rebellion. Discuss why this change happened. By the end of the 1960s, the society that gave rise to pop art had changed dramatically. The decade’s early optimism had been surpassed by disaffection and rebellion, driven by an unfulfilled desire for cultural change. Agitation around issues of race relations, gender rights and sexual liberation; the ongoing trauma of the war in Vietnam; and broader anti-authoritarian sentiment all had an impact in the realm of pop art. The emergence of a counterculture cast a shadow over consumerism and big business. Pop art’s established codes had become somewhat mainstream and new directions were now pursued. Artists like Martha Rosler, James Rosenquist and Brett Whiteley made works that expressed the tension between ominous events taking place on the world stage or at home, and the utopian pretence of ‘the American dream’. By contrast, other artists such as Allen Jones and Tom Wesselmann developed an exaggerated eroticism in their work, extending pop’s timeworn engagement with Hollywood glamour, the female body and consumer desire. Finally, a number of artists who had been at the vanguard of pop art in the ’60s explored aspects of other styles, from realism (David Hockney) to psychedelic art (Martin Sharp).